All right, show of hands, how many people checked out after I mentioned Friends? Yeah, I shouldn't have led with that. My point is, while grand, stormy affairs can lead to terrific drama, it can be just as satisfying to see characters hook up unexpectedly, not as part of a great plan, but because of affection and chance and sudden inspiration. So I always liked that Amy and Kif got together because of what was supposed to be a one-off joke. Fry and Leela's connection gave us some of Futurama's strongest moments, but it's nice to have two likable secondary people getting on well together on the sidelines. Their brief break-up fuels the plot of tonight's excellent episode, and Kif doesn't get a whole lot of screen-time outside the first act, but I'd be lying if I said I wasn't relieved to see them together again by the credits. It was a sweet cap to an all around fine piece of work. Another show of hands: how many of you expected me to open with some speechifying about gay marriage? I considered it, but I'm not sure I have a whole lot to say on the topic that "Proposition Infinity" didn't already cover, albeit under the traditional science fiction guise of metaphor and silliness. (Basic truth: if you are against gay marriage, you are wrong. There's no way I could've gotten two paragraphs out of that, unless I busted out my Rhyming Becktionary.) As any Star Trek fan worth his salt knows, in addition to lasers and robots and teleportation, sci-fi is a great medium for dealing with tricky social issues from a sideways direction. The jokes tonight about Amy and Bender's struggle for public acceptance of their love were arguably as topical as the jokes about "eyePhones" from last week, but they were clever enough to effectively mock the absurdity of the debate, instead of just coming off as a series of cheap (but occasionally funny) shots. Really, this one was running on all cylinders. Amy and Kif's relationship woes, while quickly sketched in, made enough sense to work as a plot-spring, and given that Bender has always been a jerk to everybody, Amy's infatuation with him made just as much sense. There was as much randomness here as in the rest of the season so far, but unlike the last two episodes, the actual storytelling was strong from beginning to end. That matters, too. I don't want to over-stress emotional connection and internal logic too much, but this has never been a series where the characters are incidental to the humor. Futurama works best when it gives itself a good framework to riff over, so that even if individual gags don't land perfectly, the foundation holds your attention until something that does work comes along. Thankfully, the hit-to-miss gag ration in "Infinity" was on the money. Even a throwaway bit like Hermes' "clown-itis" worked, starting off out of left field and then hitting the sweet spot with Hermes' sad, "Children of all ages" line. (The pill bottle full of spring snakes was just icing.) 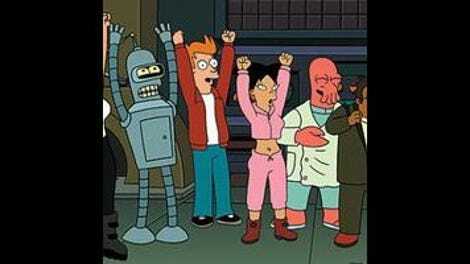 Fry and Leela were mostly in the backseat, but it was a nice touch that, of everyone at Planet Express, only Dr. Farnsworth had any issues with Amy and Bender getting it on. Satire-wise, we got the terrific anti-proposition infinity ad ("As a mother, those things worry me,"), the robo-priest (from "Hell Is Other Robots") who was way into his work, and the reveal that Farnsworth's objections to the marriage were founded on a broken heart. This isn't a huge twist, but that's kind of the point. There really is no logical reason to oppose gay marriage, so why pretend the whole issue isn't based on irrationality and selfishness? The ending, with Kif and Amy reuniting, wasn't a shock either, but it makes its own psychological sense. Even if Amy is attracted to bad boys, she wants a monogamous relationship, and you need a more stand up, tofu-like creature for that. I'll admit, despite my cavalier attitude, I was concerned after last week that this show had forgotten how to be really good, and I'm glad to say I needn't have worried. This is the series I've been missing for years. It was goofy, spastic, over-stuffed, occasionally cruel, and bizarrely sincere. 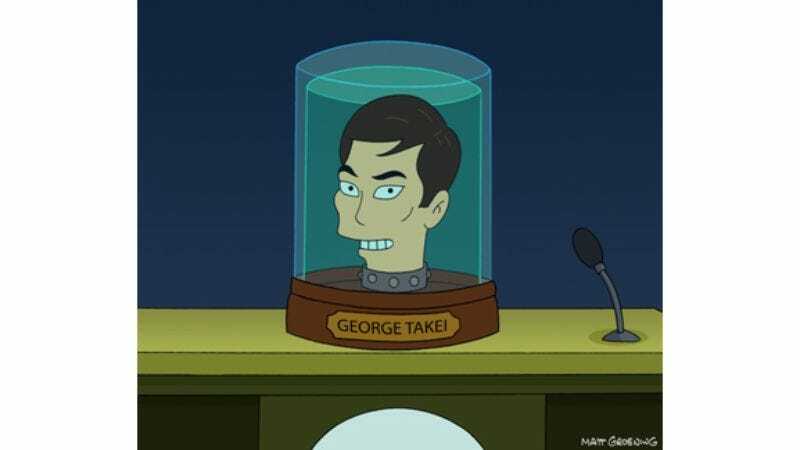 Also, it had George Takei and Hedonism-Bot. What the hell more could anyone want? I would like one of Bender's tile self-portraits now, please. I really want to know the story behind that ghost and horse marriage. "I've just learned that my final words are, 'Back to you, Linda.'" "Well, well, time to beat him his rights." "You know that floor safe where you keep ten grand. There's five grand in there." "But of everyone I ever dated, you're probably in the top ten." "Look! A single mother! Let's get her." "Oh the humanity! Also Bender." "The only lies worth believing are the ones in the Bible." "My parents may be evil, but at least they're stupid." "I finally found someone I want to spend the rest of her life with." "Nah, I'm just a pre-op transformer." "We can't compete against that much stock footage of clouds!" "Back when I was full of piss and vinegar, and my bed wasn't…"